Nov 2016 Revd. Joe Johnson added. Dec 2012 Transcript of 1883 Poor Rate Book added. on Sat. 2nd March at 2 pm. This web-site is concerned with the history of the parish of "St John's, Castlerigg and Wythburn" in the English Lake Distict. The parish lies just southeast of Keswick, northern Lakeland's principal market town and centre for those wishing to explore valleys like Borrowdale and Newlands and the area round Bassenthwaite Lake. This parish is just as interesting however. It includes the lake of Thirlmere with its unique history, the ancient Castlerigg Stone Circle which dates from about 3000 BC, the ancient British Fort above Raven Cragg, and other historically important sites like Adam's Cross which lends its name to this website. .The Vale of St John’s is justly celebrated for its beauty, with the arresting ramparts of Blencathra at the north of the valley, but there is more to the Parish than the Vale alone. As the name of the parish indicates, the Castlerigg area is also a part, including the famous Castlerigg Stone Circle. 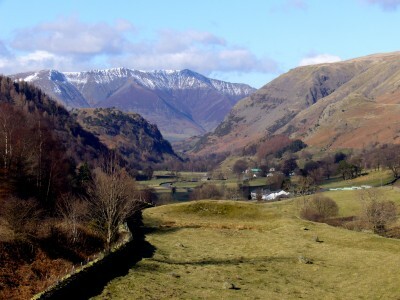 The valley of Naddle, separated from The Vale by High Rigg leads to Legburthwaite, and then south to the parish of Wythburn, which includes Thirlmere, now a reservoir for the industrial north-west, but once a haven of beauty containing the two small lakes of Wythburn Water and Leathes Water. This Site is called "Rediscovering Our Past". We explore aspects of the past history of the parish, concentrating on the histories of individual houses and farms, the homes of people for generations.We published a book in 2012 with the results of this work which was of great interest to local people as well as a wider circle wanting to know more about the social history of this rural part of Cumbria. A history of the houses and people in the old valley"
which will be launched on Sat. March 2nd 2019 at Thirlmere Rec.